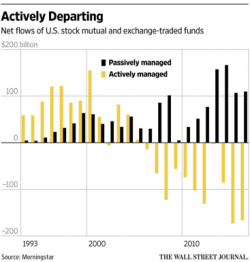 Revisiting Active Investing: Is the Trend in Passive Over? Over the past few years, financial advisors and their clients, in search of low-cost ways to capture market performance, have piled into passive investment strategies. As the Wall Street Journal reported recently, for the three years ended Aug. 31, 2016, nearly $1.3 trillion flowed into passive mutual funds and ETFs. For investors, it seemed like a “no-brainer” move in a low-risk, low-volatility environment, with an upward trend for equities. For years, I’ve been advising investors not to pay up for “beta”—that is, market exposure that is far easier and cheaper to capture with an ETF that seeks to replicate the S&P 500 or another index. But the rush to jump into passive and dump active may have thrown out the proverbial baby with the bathwater. There is growing evidence that active investing is coming back into favor. As Barron’s reported, since July 1, 60% of actively managed funds are beating the S&P 500, the highest level in nearly two decades. While investors may still benefit from having a portion of their portfolios dedicated to cheap beta, we believe active investing has a role to play in overall portfolio strategies. In fact, active investing, in our view, could very well be an answer to the essential question for investors (one that has become muted in the rush to passive investing): What is my long-term portfolio objective? This question has become more relevant because, as we have observed, investors are taking on more risk with less professional input and guidance. In our view, this is reminiscent of the herd stampeding into tech stocks in the late 1990s, just before the 2001 recession—a time when a diversified portfolio of anything other than tech stocks would have weathered the storm. To be clear, the current spotlight on active investing is not due to the surprising outcome of the U.S. presidential election and increased volatility of global equity markets. However, greater uncertainties and perceptions of increased political risk in the US and abroad are raising questions in investors’ minds, especially about potential changes in economic and political policies. At Astor, we have heard from many investors who are asking such questions. As we’ve found, investors who had piled into low-volatility and passive strategies wanted guidance and interaction with professional managers. And robo-advisors with their static portfolios don’t call you up to discuss long-term trends that may be impacted by a new president or changes in policies, interest rates, and so forth. Our message to investors echoes our fundamentally-driven approach. At Astor, we use our proprietary Astor Economic Index® to identify the current economic trend and then make portfolio allocation decisions accordingly. We augment equity holdings with fixed income as we dial risk up and down. Furthermore, we allocate to additional non-equity assets that we believe will benefit from long-term market trends that are often hard to capitalize on with static or passive strategies. Taking a dynamic approach allows investors to be more mindful of opportunities among asset classes or sectors. We do not advocate market timing, trying to pick tops and bottoms; however, we do believe that greater flexibility may be key to identifying those sectors that are more likely to perform favorably over the next several quarters or years. In fact, we believe there could be significant differences in performance from sector to sector. Already we are seeing divergence in performance among styles and sectors. Small cap stocks are having a good run of late, while technology stocks are lagging. International markets are moving with in line with developed economies, while emerging economies are struggling. Risk premiums are changing around the world and among asset classes. Non-equity assets such as gold, currencies, and high-yield bonds are behaving in potentially diversifying and accretive ways. Investors holding fixed income investments should be mindful of rising interest rates, higher inflation, and yield curve fluctuations. Opportunities in metals, currencies, and international holdings should be considered for both diversification and the potential to generate a positive return through dynamic asset allocation. While passive investing still has its place, in our view the time has come, once again, for taking a more dynamic approach to asset allocation as part of overall diversified portfolio solutions.